LONDON — Archaeologists have discovered what they believe is the first evidence of Julius Caesar’s invasion of Britain, the University of Leicester announced Tuesday. Its team have unearthed new evidence suggesting that Caesar’s fleet landed at a bay on the Isle of Thanet in the English county of Kent, around 70 miles southeast of London. The location and landscape of the Pegwell Bay site matches Caesar’s own account of his landing in 54 BC, according to the university. The archaeologists found the presence of Roman weapons and other artefacts at a spot overlooking the bay, indicating it may have been a Roman fort built to protect the fleet that had arrived on the nearby shoreline. The findings will be explored in a BBC documentary airing on Wednesday. The University of Leicester project, funded by the the Leverhulme Trust -- one of Britain’s largest all-subject providers of research funding -- involved various activities. This included surveys of hillforts that may have been attacked by Caesar, studies of objects in museums that may have been made or buried at the time of the invasions, such as coin hoards, and excavations in Kent. The work was prompted by the discovery of a large defensive ditch in archaeological excavations while a new road was built in the area. 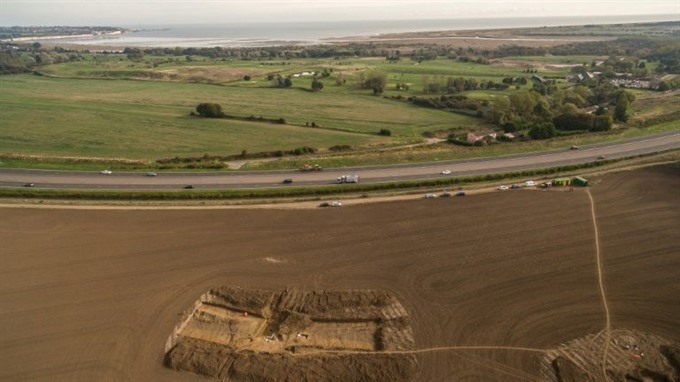 Simon Mason, principal archaeological officer for Kent county council, who oversaw the original road excavations, said: "Being so close to the continent, Thanet was the gateway to new ideas, people, trade and invasion from earliest times."